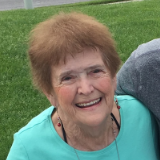 LaVerne M. Fanning, 82, of St. Joseph, MO passed away March 25, 2019. She was born on January 7, 1937 to Ernest Glen “Joker” and Leona Berniece (Schottel) Brown in St. Joseph, MO. LaVerne grew up in rural Easton and graduated from Easton High School. On August 31, 1956 she was united in marriage to Eugene Howard Fanning. After their marriage they lived in Hiawatha and Atchison Kansas and settled in St. Joseph, Missouri where they made their home. Eugene passed away on May 21, 2018. LaVerne retired from Adco formerly Geeco in St. Joseph. She was a member of the Baptist Faith. LaVerne enjoyed watching dirt track racing, camping, and watching the Chiefs and Royals play. Most of all she loved following her grandchildren’s sports and spending time with family and friends. She was also preceded in death by her son Randy Eugene Fanning on September 25, 2018 and her brother Ronald Brown. LaVerne is survived by her daughters Pamela Marie Yates and husband Joseph and Terri Moppin and husband Roy; daughter-in-law Tammy Fanning; grandchildren Kevin Eugene Snodgrass, Jr. and wife Jonna, Christopher Michael Snodgrass, Casey Ryan Snodgrass and wife Crystal, Cydney Moppin, Bryar Moppin, Ashley Fanning, Amberly Fanning, Alexus Fanning and Alyssa Fanning; several great and great-great-grandchildren; brothers Donald Brown, Marvin Brown, Jerry Brown, and Richard Brown; sister Barbara Hess; several nieces and nephews, other relatives and many friends. Burial: 1:30 p.m. Wednesday March 27th at Memorial Gardens Pattonsburg, MO.